Recap of the Last 5 Games (Games 41-45) · Let's Go Amerks! Welcome to the ninth part of a 15 part season series highlighting the last five games (the last segment will be six games) showing off the stats, standings, highlights, transactions and whatever else took place prior to the next five games. The goal is to post these the day of the next game of a five game set. A little different than a weekly format to give us a better snapshot of trends as the season goes. The team finished the last five games with a record of 4-0-1-0 to gain nine points in the standings. There has only been one other stretch of the season where they finished this well and that was games 6-10 in the first month of the season. There were wins against Binghamton (two), Utica, and Hartford. The only loss was in the first 10 seconds of overtime against Syracuse in a close game. The only Rochester Americans focused podcast in the world! Recorded every Sunday. Another hot stretch for CJ Smith put him back into the top 20 overall in the league for scoring. He’s currently tied for 14th overall with his 41 points. 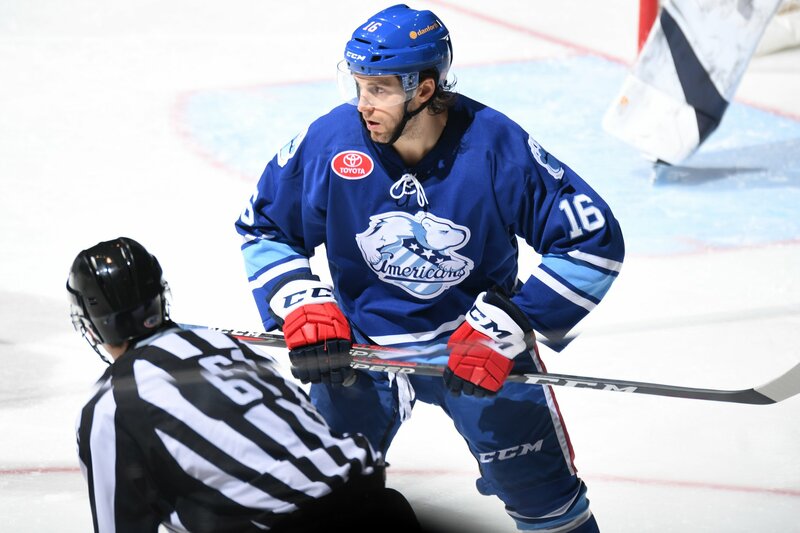 He was called up to the Buffalo Sabres and after scoring another goal we may not see him back until the post season. Zach Redmond continues to lead the team in goal scoring and continues to lead the league in the defensemen category for scoring. Redmond broke the Amerks franchise record for goals by a defenseman in the regular season when he scored his 19th goal. Unfortunately he’s missed the last four games after being injured in the final moments of that record breaking game. In the last five game recap I had mentioned the second half of the season is all about points and that’s what the team did earning nine out of a possible 10 points. The points are what will keep them in first place and they also moved into 2nd overall in the conference and league. The team had been sitting at 3rd overall all season. The word depth has become cliche in a way but it was put to the test over four of the last five games when the team played without Zach Redmond and Scott Wedgewood. Redmond remains out with a lower body injury but is expected back sooner than later. Scott Wedgewood is healthy and ready to play. CJ Smith shared the phrase next man up when it comes to missing players whether it’s due to injury or call up. You can’t replace your number one defenseman and number one goalie but it can provide an opportunity for the next man to step up. Another cliche is playing 60 minutes of hockey but that’s what this team has done over the last five games (for the most part). That’s not to say they’ve been perfect games as they’ve had to erase deficits to come back and win but one thing they haven’t done is played on their heels. February is arguably the toughest month of the season and the team is trending upwards instead of hitting a plateau like they did last season at this time. This is while playing with key players out of the lineup. One concern is that Rochester has lost a division high four games after leading the game going into the third period. Four games may not seem like a lot but when you’re above everyone else it’s a big number. The overtime loss to Syracuse was an example of giving up a goal with less than 90 seconds to play in regulation. Something to keep an eye in as the season starts to speed up towards the end. Remi Elie has joined the team after clearing waivers and will play in his first game tonight. Like Scott Wilson and Taylor Leier it may take a game or two for him to adjust. Elie’s best season in the American League was 2016/2017 when he had 28 points (9G+19A) in 53 games with the Texas Stars. He also brings valuable Calder Cup playoff experience as he played in 19 games last season as the Stars lost in the finals to Toronto. There was a time earlier in the season when Alex Nylander was talked about as having turned a corner but we’re back to asking questions again. In his last 20 games played he only has 6 points (2G+4A). The time has passed us by to say he’s still young, he was injured, or he should’ve spent an additional season in juniors. There’s only 31 games remaining in the regular season, it’s time for the top prospects to shine, not fall behind. As a comparison, Eric Cornel in his last 20 games has 9 points (4G+5A). By comparison in the first 20 games of the season Nylander had 17 points (6G+11A) and Cornel had 5 points (2G+3A). The last two games saw goals from Eric Cornel (2), Yannick Veilleux, and Tyler Randell. The goals from Veilleux and Randell sparked the come from behind win in Binghamton and Olofsson scored the game winner. Secondary scoring is what is needed at all times and that fourth line stepped up. Bill Belichick won another Super Bowl coaching the New England Patriots and it’s something that Chris Taylor gave a fist pump to when it was brought up. Don’t hold it against him. While a lot of people, especially locally, will dislike Belichick for a lot of reasons you have to respect what he’s able to do as a coach. Roster turnover? No problem. Injuries? No problem. Offense isn’t scoring? No problem, play defense. Defense is playing well, time to work on the offense. All of that can be compared to what happens in the American League. There’s a big difference in plus/minus on the active roster right now between two defenseman. Jack Dougherty is leading the team with a plus-15 and at the other end is Andrew MacWilliam with a team low minus-10. Matt Tennyson is slightly ahead with a minus-9. That’s a big difference. Last season MacWilliam finished with a team high plus-19. The stat overall is flawed for a lot of reasons but a large gap like that is eye opening. MacWilliam is playing against the top lines vs more of a shut down role he had last season but as mentioned earlier in the season, Dougherty is a prospect to watch. Wayne Simpson ended his iron man streak of 231 consecutive games when he missed a game this past Saturday in Hartford. He said something happened the night before and it just wasn’t worth the risk playing a game for a streak he already set. The stretch started on January 29, 2016. There’s a lot of positives from the last five to enjoy and recap but tonight is a new night for a new stretch of games. It’s pretty simple, score more than the other team and win! Over the last five games the Amerks outscored opponents 20-14 which was fueled by a seven goal night against Binghamton. One challenge the team appears to face is goals scored early and late in periods. An upcoming project will be to deep dive that stat to see if there’s more to it or it’s a perception issue. There Amerks had another game with over 50 shots on net and they continue with the focus of shoot first mentality. Through the five game stretch they had a 168-151 advantage in shots. This was the first give game stretch where the penalty kill unit was perfect. The power play has remained consistent to keep them at 6th overall in the league. Heading into the 46th game of the season the Amerks continue to stay in first place in the North Division where they’ve been all season. 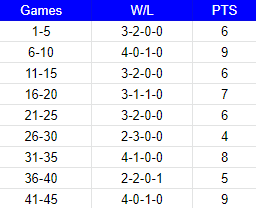 Looking at the conference and league level the Amerks moved into 2nd overall. The Amerks are currently on an eight game point streak with a record of 6-0-1-1 but at the same time the Crunch are on a six game winning streak. The North Division is going to continue to be tight and exciting. Have to go with the shootout winning goal against Utica on January 25th at home. The Amerks tied the game late in the third period with a good home crowd and Taylor Leier won the game as the seventh shooter in the shootout. A great opportunity for the “new guy” to make his name known in front of the home crowd. Zach Redmond – lower body – day to day – as of publishing this hasn’t started skating with the team again.